Until recently my collection lacked the best of British. 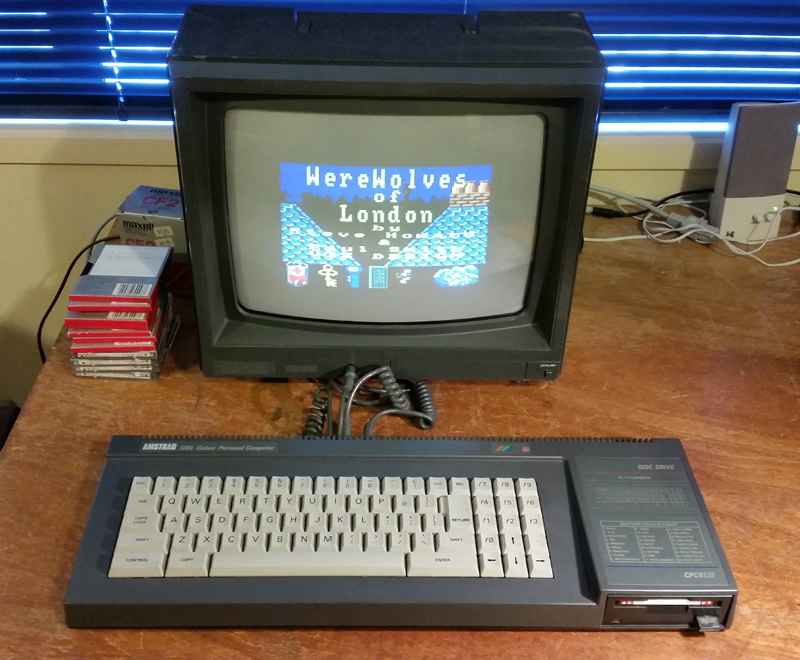 Acorns and Sinclairs aside, no quintessential collection is complete without an Amstrad CPC. Earlier this year I went to great lengths to acquire one, importing a CPC464 (the one with the funky coloured keys) from the other side of the world. It was with a certain irony therefore that soon after this event, a "downsizing" New Zealand classic computer collector offered me a CPC6128 at a price I couldn't refuse. Within a month I went from having no Amstrads, to having 2 sparkling and pristine units, both representing either end of the CPC spectrum. Upon arrival most of my computers need a health check and tidy up before they become fully established residents of Tezza's home for elderly classic computers. This usually involves minor fixes, getting some peripherals and stocking up on software. 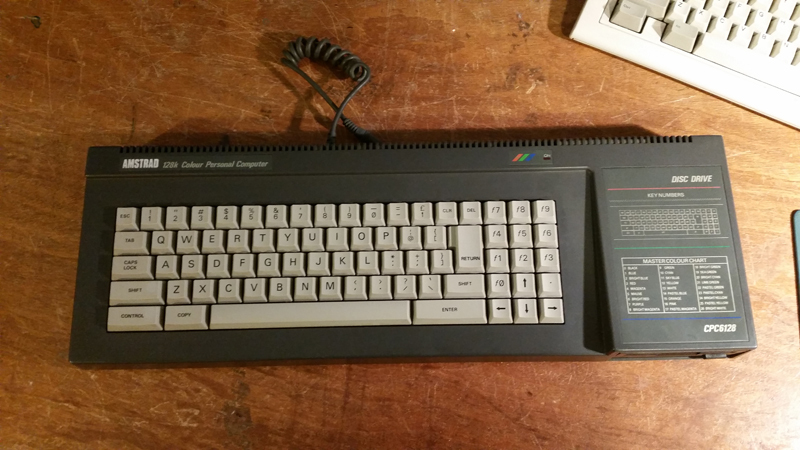 The CPC6128 was no exception. I was chuffed with this addition. 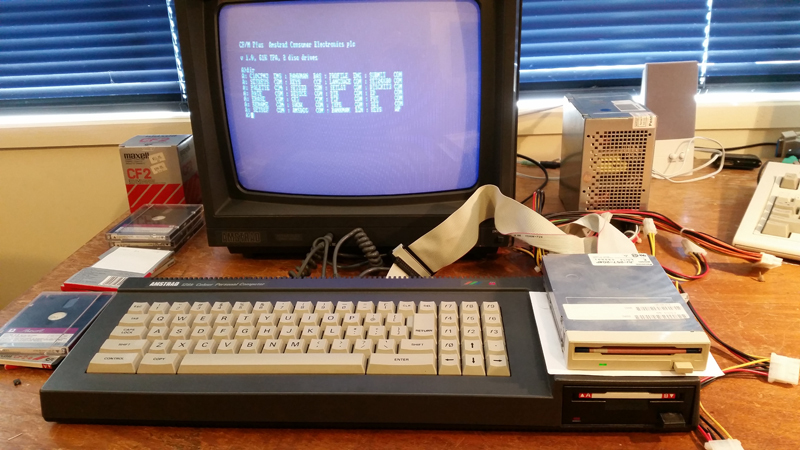 I love my CPC464 but this one had a disk drive! The 6128 also had a sleek, more serious colour scheme than the 464 and some design aspects had been improved on such as the sensible location of the cursor keys. It was also about 2cm shorter in width. Bundled with the machine was a number of game disks and two copies of Amstrad CP/M on two disks each. The disks were interesting. I'd never seen 3 inch disks before. They appeared very rugged, and were slightly thicker than the more common 3.5 inch ones. Both sides of the disks could be used but you have to flip them over to do so. Things looked promising at first. The screen was stable and clear, all the keys seemed to work and so did the disk drive. I could load CP/M and most of the games without any issues. The first sign of trouble showed itself when I couldn't format a disk. Hmm. Then there was that game which required the disk to be writable while playing. It kept insisting that the disk was write protected when it clearly wasn't! OK, so something was not right. Googling around found this article by DataServe retro that suggested a cause. Apparently some Amstrad drives (as with some Spectrum ones) had a small pin which fitted into a hole in the drive innards . Without this pin, a drive could read but not write to a disk. Apparently this pin could easily fall out of the drive when it was being worked on and, unnoticed, be lost! A missing pin fitted the symptoms. Using the instructions under the linked URL above, I took the machine (Figure 3) apart, then the drive, and went looking. Sure enough, there was the small hole present where a pin should be! As luck would have it DataServe retro sold spare parts for the Spectrum 3+ . Why is that relevant? Well the Spectrum 3+ has the same 3" drives as the Amstrad CPC6128, both brands being owned by Amstrad by the time they came out. 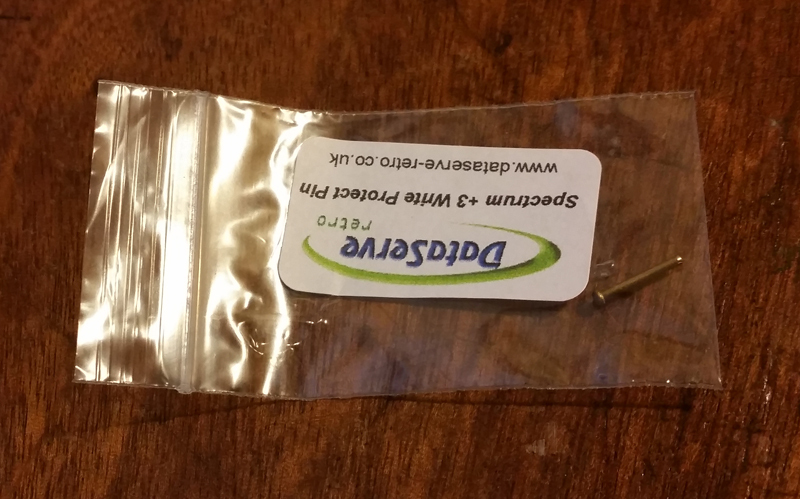 Among the spare parts for sale via the website were these tiny write-enabling pins! One was duly ordered and I got a couple of drive belts at the same time just in case. 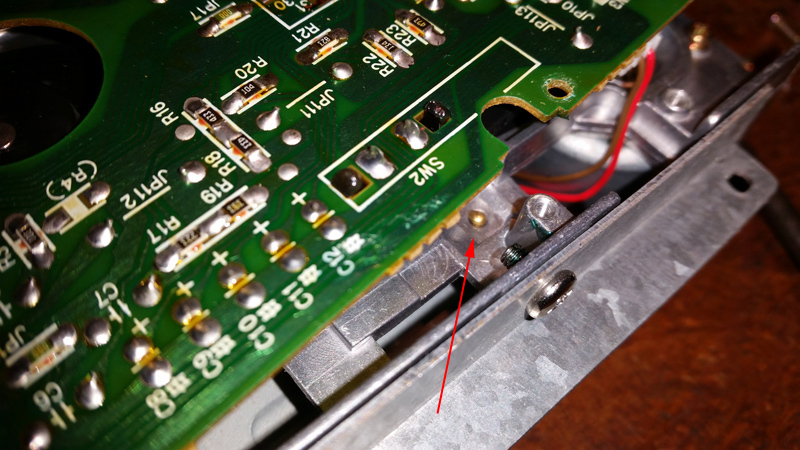 When the pin arrived (Figure 4), it was very simple to disassemble the drive again and fit it (Figure 5). 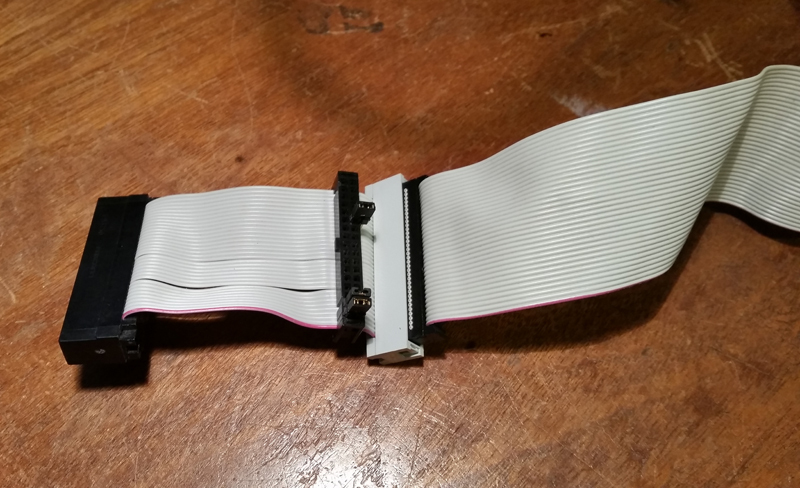 A test after reassembly showed a drive that was fully capable of reading and writing. Problem fixed! In the meantime I'd also found someone here in New Zealand selling 10 blank, sealed 3-inch disks so I took the opportunity to sequester some media for a software library. I had CP/M and some children's games on disks but none of the classic Amstrad software which made it shine as a gaming machine. I knew disk images were available on the Internet but the problem was how to get them onto my 3" disks? With most of my other machines it was easy as they had either 5.25" or 3.5" drives. These were also the drive sizes on my PC hence one could easily produce real disks for the classic machines by sourcing disk images from the web and writing them to blank disks on the PC. A bit of research and I had the answer. It is all here on this very useful wiki. The disk interface in the CPC6128 is very standard and can easily accommodate 3.5 inch disk drives. What's more it has a card edge out the back. This could mate with a 5.25 inch drive connector found on old PC floppy disk cables. These cables normally had a 3.5 inch connector as well. 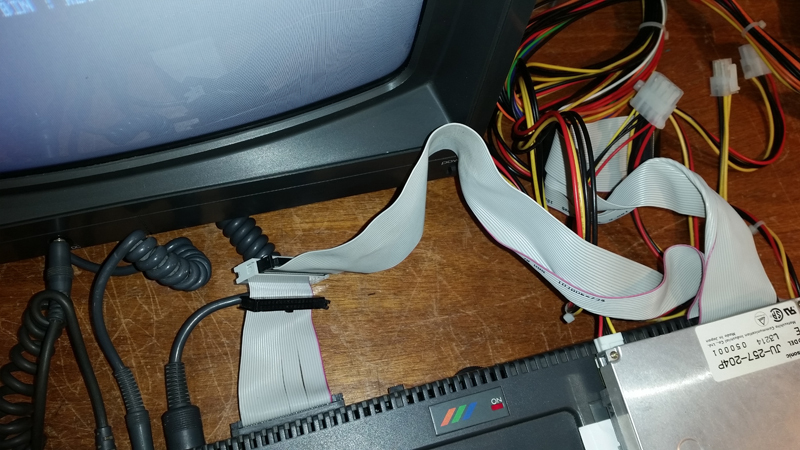 If I attached another 3.5 inch connector to the cable alongside the existing one and plugged a standard PC 3.5 inch drive into it, I would have a second drive, that could take standard 3.5 inch disks! Specify what side of the disk is to be used (side 1 or 2) (connect pins 31 and 32 to switch to side 2). This is necessary as you can't flip the disk over like the 3 inch ones. Set the ready signal by connecting pins 33 and 34. The only other thing required was a power source for the external drive. An old PC PSU did the job admirably. The whole thing looked ugly and messy, but it was just a temporary arrangement. I could now write CPC disk images off the web and onto either side of 3.5 inch double density, (NOT high density) floppies using software called CPCDiskXP. I could then take this disk, insert it into in my cabled external. 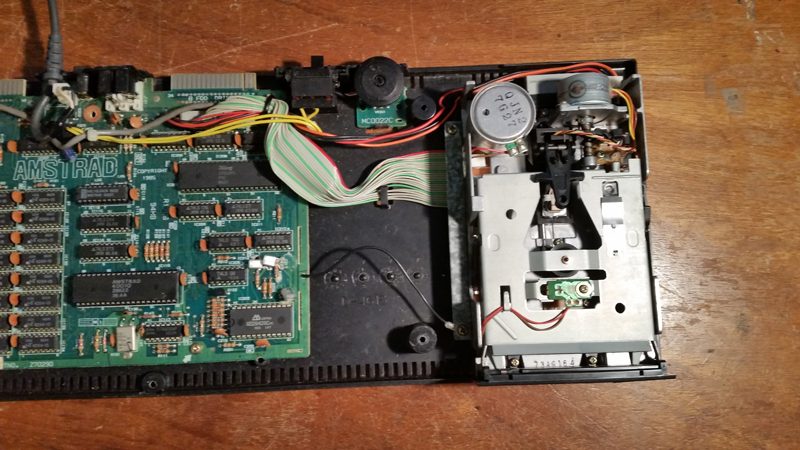 bare, 3.5 inch drive attached to the CPC6128 and copy the contents onto 3 inch disks in the internal drive. For disk to disk copying I used the diskcopy utility that came with the bundled Amstrad CP/M+ package. Figure 8. Dual drive Amstrad CPC6128. Not pretty but it works! In no time at all I had a good software library on my 3 inch disks. Titles include, Werewolf of London, Harrier Attack, Roland on the Ropes, Chase HQ, Fruity Frank, Donkey Kong, Mission 1 (project Venus) and Trivial Pursuit. I also collected a word processor (Protext) and a utility package (Pyradev). Finally I copied a "10 years of CPC" demo disk, to show off the computer's capabilities. Once I'd collected enough titles to suffice, the external drive, its cable and PSU were were put away for another day leaving the computer looking sleek and tidy again. Figure 9. 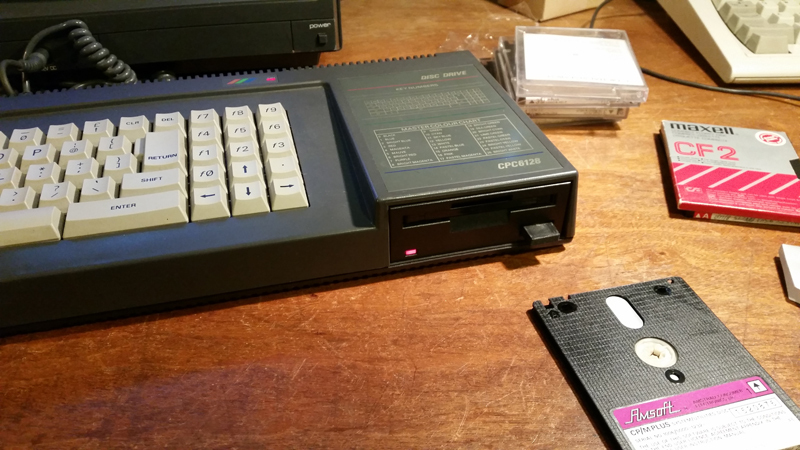 The Amstrad CPC6128. Locked, loaded and ready to go! So, now my Amstrad CPC6128 is happy and so am I. It's fully working and is stocked up with CP/M and classic games software along with one or two utilities thrown in for good measure.